During World War I prices in Germany had doubled, but the real trouble started afterwards. The new German Weimar government was bound by the Treaty of Versailles – designed to ensure that the grandees of the now defunct German Empire could never wage war on their neighbors again. The Treaty’s terms put the Weimar government under intolerable financial pressure; it would have been a miracle if the ailing German economy had recovered. The stupendous amount the Germans had to pay the Allies in reparation for the war meant they couldn’t afford to buy imported goods, and the loss of their colonies meant they couldn’t rely on cheap raw materials. At the same time billions of marks hoarded during the war suddenly came back into circulation. The rising cost of goods combined with a dramatic increase in the money supply created perfect conditions for inflation. Before World War I the exchange rate was just over four marks to the dollar. By 1920 the value of the mark was 16 times less. Here it stabilized at 69 marks to the dollar for some months. The government was still in a position to get a grip on the economy; instead it chose to print yet more money in order to pay the reparation debt. By July 1922 prices had risen by some 700 per cent and hyperinflation had arrived. The government had to print million-mark notes, then billion-mark notes. By November 1923 $1 was equivalent to 1,000 billion (a trillion!) marks. A wheelbarrow full of money couldn’t buy a newspaper. Shopkeepers couldn’t replenish their stock fast enough to keep up with prices, farmers refused to sell their produce for worthless money, food riots broke out and townspeople marched into the countryside to loot the farms. Law and order broke down. The German attempt at democracy had been completely undermined. 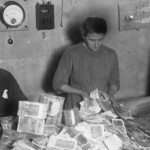 Toll: Millions of Germans were bankrupted – an entire life savings sometimes wasn’t enough to buy a loaf of bread. Conspiracy theories sprouted and extremist political views became acceptable. Ultimately, hyperinflation enabled Hitler to gain power. You should know: A new currency, the Rentenmark was introduced in August 1924, backed by the US gold reserve, and realistic reparation payments were agreed. Although economic mismanagement on the part of the Weimar government is usually blamed for causing hyperinflation, evidence suggests that speculators were in large part responsible: they started ‘short selling’, effectively betting on the value of the mark dropping.